Gunner Wilkes is sure of one thing: his rock idol, Horatio Slice, didn’t explode in a pyrotechnics mishap like the press is claiming – he was sucked through a portal into another dimension. After building a machine he hopes will bring the rock god back to Earth, Gunner falls into an adventure beyond his wildest dreams. 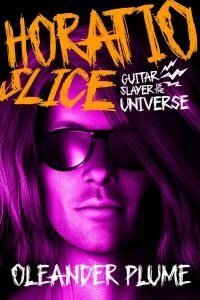 Featuring a cast of horny characters, Horatio Slice: Guitar Slayer of the Universe, is the epic, pornographic gay adventure you didn’t know you needed.